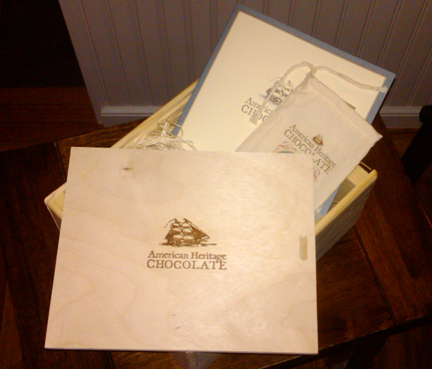 Home » All Natural » American Heritage Chocolate: I say good show sir! I’m watching a DVD I received from Mars Inc‘s latest little candy making sect. The mini film has people in colonial costumes and a Disneyland woman’s voice explaining how they made chocolate back in the olden days. The process is kinda cool — they got the beans out of Ecuador, roasted them sometimes light/sometimes dark, made the “nuts” into nibs, then crushed them on a heated big stone that made a paste. Add sugar and spice and everything nice. Easy peasy. It appears from the packaging, the DVD, the web site – that Thomas Edison and George Washington’s milieu loved chocolate (oh whoda thunk). And the Mars Inc. folks are leveraging this old world school love of the dark bean to make the American Heritage Chocolate, like the fathers and mothers of our country made it. Huh. Unnnnkay. This came to us in a box – an olde school one with hay and twine and stamped olde tyme fonts on it. 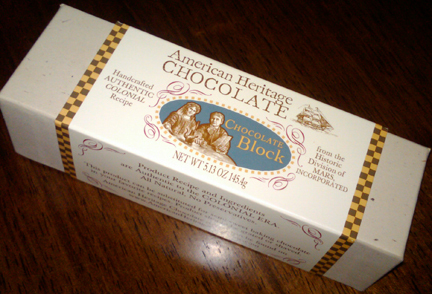 It also came with a nice letter that said, “American Heritage chocolate celebrates what we love about chocolate in America.” Hm. Is there bacon on these? Cuz that’s what I love… Alas no bacon. Opened the box and it smells great. Kinda like a wine cellar. Very earthy and a bit spicy and woodsy. It smells old school. Almost musty but in a good way. Before I dig in let me tell you how I experience chocolate, then you can do the math on whether what I like is what you like and at the end of my diatribe, you can better determine if these American Heritage chocolates are your thang. So — I like chocolate a lot but don’t loooove it, mainly because I like the physical act of eating and I simply can’t eat too much chocolate at one sitting. Too filling for me. Also, I like to chew a gummi substance – the oppo of chocolate substance. Still, as I’m generally human at my core and only partly robot, even I can’t deny the smooth sexiness and general overall awesomeness chocolate affords. They look good huh. Cuz they’re goddamn great. Seriously. 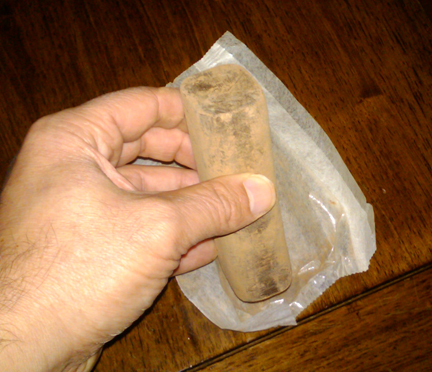 Hefty when I picked them up – like a steel screw without the threads – and covered in choco dust. They’re thick and gritty at first bite and then quickly become smooth in your mouth. The flavor is roasted and savory, a little orange in there, nutmeg I expect, and maybe vanilla. 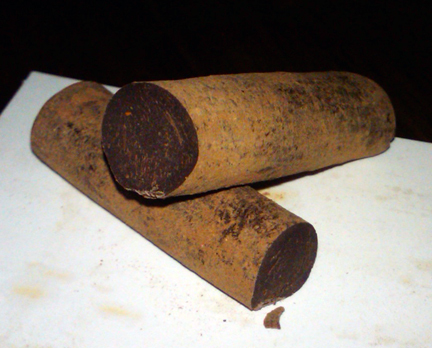 According to its all natural ingredients, it has Annatto, a red food coloring that’s flavored slightly peppery sweet. And my thing with chocolate where I don’t like a lot of it? Sorta dissipated away and I ate and ate and then was stupid and only had one left, which I promptly photographed. Hearty and tasty and not too sweet. I guess colonials weren’t just good at making countries. These little puppies are yumsville. Big much? And bulky. Look at the size – you sure as heck don’t eat this by yourself at a sitting. It’s a block of baker’s chocolate essentially. You could cut it up with a hatchet and eat it plain but likely you’d want to cook with it. It tastes just the same as the other one. Again. yum. They also make a hot chocolate – probably tasting just as good if not just the same. Now it’s not all tea an crumpets. I’m not really sure what Mars is going for here, or rather, who they are marketing to. I could potentially see the sticks in that section of an airport store where they’re trying to sell you high-end things that are suspect, or at Disneyland before DL only sold things that say “Disneyland” on them. Of course you can get this all over Willamsburg and other parts of Virginia. But for you and I joe and joely blow, living west of the Mississippi — if we’re not making Top Chef Desserts, not sure where and when we’d procure. Still – this stuff is quite dashing. You could build a country around it. looks legit and old school. Still, I’ve realized that for ME, since I’m not like my wife-a dark chocolate nut- I need some other flavor involved : nuts, salt, of course bacon, pepper, etc. I don’t think I’d like all that dust, but I might get over it. Nice packaging. Awesome insight, I think I would make fudge with it, and make hot chocolate. You can get some chocolate covered bacon from Marini’s via Santa Cruz Beach Boardwalk. Now you can even order it online.